I found out at 8pm last night. At 8am this morning, I am still in shock. I did not actually know Robin Williams, but I felt as though I did. The world lost a loving, funny Grandfather last night. I am not going to pretend to know what was going on in his life or how he felt. I am not going to pretend to understand. I have never talked about this, but I have some personal experience with suicide. Luckily, this person in my life has never succeeded. There have been many, many attempts. I used to go to middle school everyday crying and afraid to leave because I was afraid that it would happen....and high school...and even some in college. This person has always been a strong rock to me. A superhero in the eyes of a little girl. You really can never know what demons a person is battling. I don't understand it, but I try to. There is a lot of pain and anger. For the person in my life, it was due to the loss of a very close loved one. They struggled with serious depression over this loss for years and years. They still struggle with it today, but they are stronger. I was a child when it started and did not know what to do. I tried to reassure that person that they were needed and loved. It wasn't enough. I think now, years later, it finally is. This person has depression still but they also know that they have a lot to live for. It was a battle to get to that point. A battle that many do not survive. I beg those of you with depression to confine in loved ones. You may feel alone, but you are not. Almost everyone out there has at least some family, some friends, someone that will be heartbroken and torn apart when you are gone. Most of us have dozens. Robin Williams had billions. Please, Please reach out. If you feel as though you can not talk to family or friends, call a stranger. There will be no judgement from a stranger on a hotline that wants to make you feel better. Often talking can relieve so much stress, anxiety and anger. Please, try. If you have loved ones that struggle with depression, hug them harder tonight. They do not ask for the depression. They are battling it everyday. It is hard for them. It helps so much to reassure them. There is also help for you out there if you seek it. To that person in my life, I love you more than anything and I am always here to fight beside you. I do not pretend to understand, but I do my best to try. R.I.P. Robin Williams. We loved you, even if you could not feel it. My heart goes out to his family, friends and loved ones. We are all mourning with you. I was trying to explain this to my husband last night who made the "suicide is so selfish" statement and carried on his night. I don't personally know anyone who has attempted suicide but I know that depression is a very hard thing to deal with. I tried (the best I could through the tears) to explain this to my older son this morning. Great post. As soon as I mentioned it to my husband, he was sad but he understood Robin William's pressure to be "on" all the time. I can't even begin to imagine what that must have been like. The world lost a wonderful entertainer and my heart breaks for his family and close friends. The entertainment world will never be the same without him. I am in shock as well. It really goes to show, you never know what people are struggling with internally. It is all so very sad. I am sorry someone you love is going through this. My heart breaks for him , his family and for us his fans. We are all going to miss the laughter he gave us .On Facebook I once posted a quote of his that said" I would rather be completely alone rather than being in a room full of people that make me FEEL all alone". This spoke volumes to me. IT also told me that he too suffers from depression. I am so very sorry that he chose to take his beautiful spirit away from us forever. May he rest in peace. May his family find comfort and peace in this dark time. No one knows what is going on inside someone else's head. We should always try to be kind & listen to others and try to be understanding. 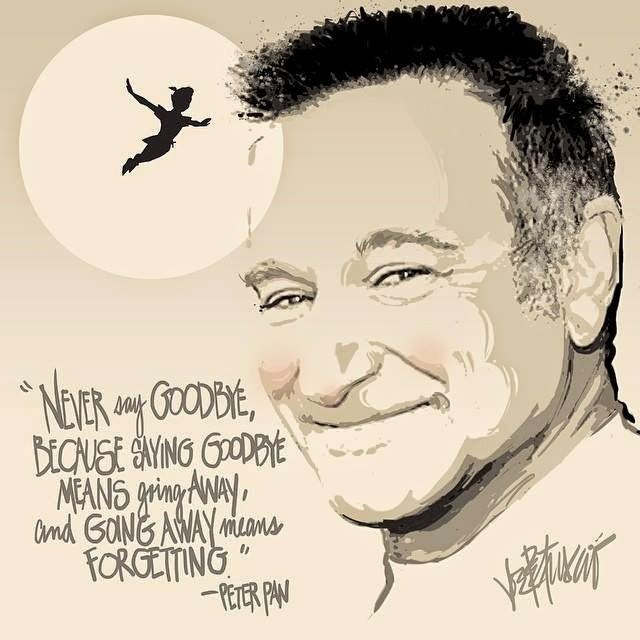 Robin Williams will truly be missed & he will always live on in his movies. It's so sad and it affects so many people. You have me crying from reading this. You tackled a hard topic very gracefully. I enjoyed your article on this (to the extent that it was well written and heartfelt, not that I want there to be a need for topics like this). I could not believe it when I was told that he died; I still cannot. It breaks my heart. I agree with you: I did not know him, but I felt like I did. He was a companion of mine for pretty much my entire life. God bless his soul and let him rest in peace. I hope that people who are struggling read this. I hope that they (including some of my loved ones) can learn how much they are loved before it is too late.